In the face of troubles, everyone will remember the name of God. In times of pleasures, many would forget the same God. Those who remember God not only in sorrow but also in a state of joy need not be scared of hardships.. In fact, it is adversity which makes us remember and pray to God. If we have fallen sick and pray to God for relief from the unbearable pain, it means that the disease that caused us to pray to Him is, indeed, a blessing in disguise. Hence, whatever hurdles we face in our day-to-day life should be treated as the grace of God. It must be viewed as the effect of our past sins. As we calmly endure pain and suffering, our sins get atoned and minds purified. God wills that we become purified souls in the fire of sufferings and pains. One day Dr. Pillay, suffering from guinea worms, came to Baba and pleaded Him to free him from the intense pain and suffering. 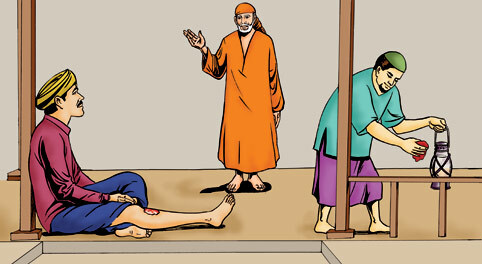 As the pain was unbearable, he even begged Baba to stop the pain and let him suffer his karma spread over ten births. Baba's heart was moved and He willed Abdul, His servant, to step on Dr. Pillay's foot and pressed out all guinea worms and healed him. Whenever we may fall sick, we must know that it is the karmic effect of our past wrong actions and learn to endure pain calmly as if it were a penance. Pleased with our cheerful endurance, the Compassionate Sai ends our sufferings.